A friend likes to say that "all roads lead to Veblen House". On a hunch, I traced the mathematical road leading back from Katherine G. Johnson, one of three extraordinary black women mathematicians in the movie Hidden Figures, and sure enough, it led back in multiple ways to Oswald Veblen. The movie itself is deeply moving and, despite the liberties it would appear to take for the sake of high drama, remarkably accurate and true to historical fact. Figuratively speaking, it sends its three main characters high into orbit, to shine in the sun, but not beyond the gravitational pull of earth. All three main characters--Katherine G. Johnson, Dorothy Vaughan and Mary Jackson--overcome a host of obstacles facing women and blacks in 1960s Virginia to play major roles in the early days of the NASA space program and computer programming. We learn, among many things, that John Glenn refused to take that first American flight to orbit the earth until Katherine Johnson had verified the mathematics upon which the flight was based. Oswald Veblen died in 1960, but he played a central role in developing the mathematical and computational world featured in the movie. Before there were machines called "computers", there were women called "computers" who had the patience and the smarts to do the myriad calculations required to compute trajectories. And before Alan Shepard could be the first American to soar into space in 1959, there needed to be a mathematician who could envision and accurately predict the full trajectory of his flight. That mathematician was Katherine Johnson, and the mathematics was built on the ballistics calculations Veblen oversaw for the military at Aberdeen Proving Grounds in the first and second World Wars. Tracing Katherine G. Johnson's mathematical lineage involves finding out who her main teachers were, and who in turn taught her teachers, reaching back in time. There's a particular passion for tracking professional lineage in mathematics, with a website devoted to the pursuit called the Mathematics Genealogy Project. Type in Oswald Veblen's name, and you find that, owing to his role as one of the "three key leaders" who "organized American mathematics" (according to Herman Goldstein), he has more than 11,000 mathematical descendants. No results came up for Katherine G. Johnson, presumably because she didn't pursue an academic career. Type in her professor at West Virginia State University, William Waldron Shieffelin Claytor--the third African American to receive a PhD in mathematics--and you find that his advisor was John Robert Kline at University of Pennsylvania. Kline, in turn, was advised by Robert Lee Moore, who developed the "Moore method" of teaching, in which the students themselves present the material rather than being passive recipients of a lecture. Though Moore's views on race may have been influenced by his father, who fought as a Confederate in the Civil War and named his son after the Confederate general, the R.L. Moore teaching method appears to have benefitted mathematics students of all races. 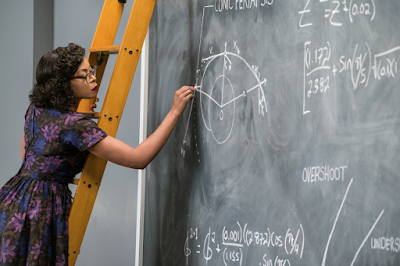 There's a scene in the movie in which the instructor hands Johnson the chalk and asks her to solve the problem on the blackboard in front of the class. R.L. Moore's advisor at University of Chicago was Oswald Veblen, just before Veblen moved to Princeton in 1905. That makes Kathryn Johnson a fourth generation mathematical descendant of Veblen. Update: An additional connection to Oswald Veblen comes through Johnson's main mentor at West Virginia State, W.W. Shieffelin Claytor, whose own brilliant career was tragically hampered by the racism he encountered. Claytor's teaching load at W. Virginia State prevented him from doing any research. Around the time that Katherine Johnson graduated (at age 18! ), Veblen, who had fought long and hard to gain American mathematicians adequate time to do research, sought to bring Claytor to Princeton University, but the University did not accept "coloured persons". Four years later, Veblen offered Claytor a position at the Institute for Advanced Study, which was not subject to the university's exclusions based on race. But by that time, Claytor had apparently grown disillusioned. He "turned down the offer saying that he did not want to be a guinea pig." The heartbreaking story is told in this online biography. 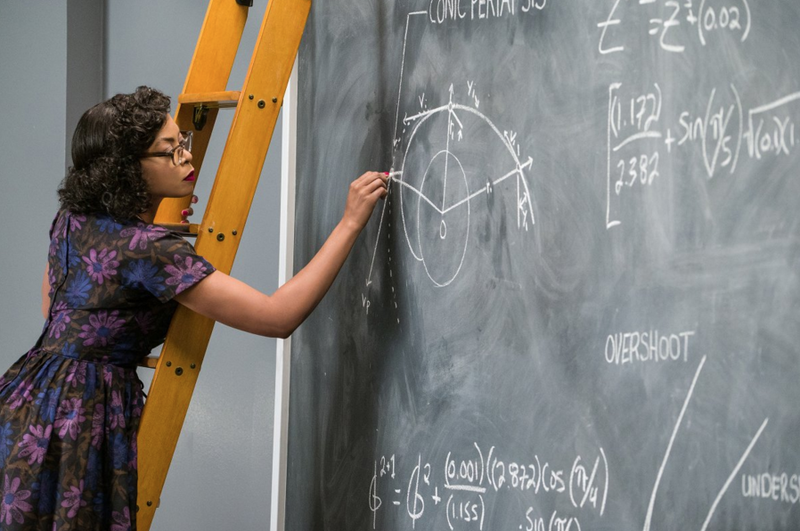 Some favorite scenes in Hidden Figures are of Johnson as a young girl, feeling the excitement of math within her as she walked down a sidewalk. Mathematics is built into the incremental act of walking--something I felt as a kid counting the steps it took to cross a grassy field coming home from school--and may have been part of Veblen's love of walks in nature, an experience he insured for Princetonians by donating Herrontown Woods as Princeton's first nature preserve. In another scene in the movie, Johnson realizes that what is needed for orbital flight was not new math, but very old math, in the form of Euler's method, from the 18th century. It's interesting to speculate on whether she might have learned Euler's method from the first African American to get a mathematics PhD, Elbert Frank Cox, whose work involved "generalized Euler polynomials" and who taught at West Virginia State until 1929. The dramatic entrance of an IBM computer midway in the movie, filling a whole room and threatening the future of the female computers, brought back childhood memories of a similar machine my father used in the attic of Yerkes Observatory. The movie caused some tearing up, particularly towards the end. Ever since experiencing that inner earthquake of my father dying--he turned his Ohio farmboy talent for mathematics into a prominent career in astronomy--there's been a channel within, geologic in feeling, through which emotion can rise to the eyes, unfettered. It's genuine emotion, but can also be manipulated to rise up by the tricks movies use to trigger a desired emotional response. To be prone to manipulation by a movie's artifice is both disconcerting and comforting. In Hidden Figures the tearing up is not only a product of the customary movie manipulation but also the deep message of equality that we carried home from the movie theater. Afterwards, researching the movie's accuracy, away from Hollywood's manipulations, the articles were as moving as the film. Here are a few, from HistoryVsHollywood, PopularMechanics, and LATimes. Permeating the movie is the urgency of the race to space. That national urgency drove an "all hands on deck" attitude that opened cracks in oppressive views of race and gender just wide enough for the brilliance of these black women to rise, and in turn influence a nation's trajectory. Particularly in our time, when government is in the grips of a solutions-averse anti-intellectualism, it is stirring to see depicted an era when science, math and courage came together to achieve great things. Other daunting challenges, climate change being foremost, await a similar integration of national character and purpose, with similar opportunities to break through the artificial barriers that divide all nations and peoples. Update: At the Academy Awards, Katherine Johnson had her moment in the bright lights on stage, surrounded by the three stars of the movie.